Day 1 - Geneva, City of Gardens. Day 2 - Montreux, Chillon and the Matterhorn Village of Zermatt. Accommodation: Resort Hotel Alex, Zermatt. Day 3 - Free Time in Zermatt. Day 4 - Elegant Baveno. 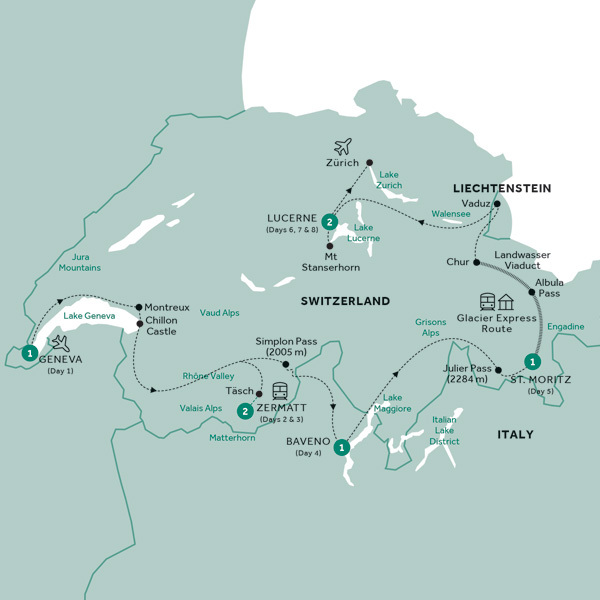 Day 5 - Grison Alps to Chic St. Moritz. Day 6 - Scenic Train Ride, Liechtenstein and Lucerne. Day 7 - The Summit of Stanserhorn. Day 8 - Leave Lucerne for Zürich.